Rebounding is a fun activity for kids as well as adults. Many of us may even remember jumping on trampolines when we were growing up. Not only it is fun but also very easy to use and after a few minutes of rebounding, you will start to experience all the health benefits. Did you know that bouncing on an exercise trampoline for 10 minutes provides the same level of cardiovascular health benefits as 30 minutes of running. The researchers at NASA have stated that rebounding increased work output significantly than running at similar oxygen intake levels. 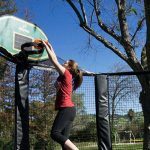 7 Rebounder or trampoline – what’s the difference? 9.1 Is jumping on a mini trampoline a good exercise? 9.2 Can you lose weight jumping on a trampoline? 9.3 Is rebounding better than running? 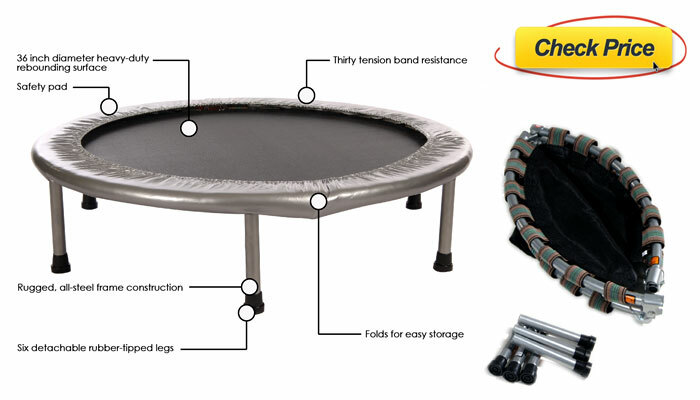 9.4 What to look for when shopping for a mini trampoline? There are different classes of mini trampolines or rebounders for adults. First is the bronze standard and these are the cheapies you can buy at Amazon or Wal-Mart. They cost around 50 bucks and are made in China. These cheaper rebounders are good to see if you like rebounding before you make a bigger investment. They should not be used for long term because they are hard on your joints. Next up is the silver standard. That’s the urban rebounder and these are good if you want to do a short term but long term is not a good option. Then we’ve got the gold standard rebounders like Needak, Cellerciser rebounders which are made in USA, backed by a lifetime warranty on the frame and has a super soft bounce. Then there is a platinum rebounder out there – The Bellicon. Made in Germany, this is truly the Porsche of all the mini trampolines out there. The Bellicon trampoline uses bungees instead of springs. These bungees not only give you a higher deeper bounce and that’s why it has longer legs, but it’s also gentler on your joints. It maximizes all those benefits of rebounding without putting a wear or tear in your body. Additionally it’s super quiet unlike the spring based trampolines. People can be sleeping next door and they wouldn’t hear a thing. However, just like the platinum itself, the Bellicon’s going to cost you. Nevertheless, if rebounding is your exercise of choice, then Bellicon may be worth your investment. Think of it like a treadmill or an elliptical, but truly, the best thing to do is to try it out for yourself. The one thing that adds up on the costs of this rebounder is that the bungees do wear out, so eventually you will have to replace them with the new ones. However, if money doesn’t matter, get the Bellicon. 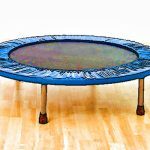 The Needak Mini-Trampoline Rebounder is loaded with 36 soft bounce springs, which means that they will absorb 85 percent of your body weight when you jump on this. There is a protective cover on the springs. The rebounder uses acceleration, deceleration and gravity to positively affect every bone, joint, muscle and cell in your body. Rebounding helps increase bone density. It aids in detoxing your system, improves balance and coordination, offers less impact on your joints than running on a treadmill while increasing the circulation of blood and oxygen. 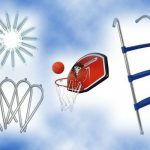 The Needak rebounder is widely recognized as one of the best rebounders available in the market. Embrace the most fun effective way to feel weightless. The JumpSport is another fitness trampoline to get into shape and have an absolute blast while doing it. Just like the Bellicon, it has elastic cords instead of springs for trampoline safety. This indoor trampoline is both quiet and convenient. It has a smooth bounce to reduce stress on your joints and every fitness trampoline comes with a basic workout DVD to get you started. The arched legs supporting the trampoline have been designed to provide the most stable bouncing platform in the industry. The overlapping padded petal mat gives you a wider cushion surface for bouncing and other exercises. The elastic corded system gives a silent workout experience. This small trampoline is designed for heavy-duty use while at the same time it is light enough to move from room to room. You can also stand on the frame without tipping the whole unit. The low cost trampolines are stiff and jarring on your joints. They are not much different from jumping on the floor. When you bounce on JumpSport fitness trampoline, you will easily feel the difference, a deeper bounce means for your workout. It helps build muscle and tone in your legs and your core. You will experience the fun cardio workout, which will help build your endurance level. The Maximus Pro rebounder is ideal if you are a professional athlete looking for an intense cardio training workout. It features a robust non-slip surface and an advanced large spring system for a very low impact bounce. The legs fold up for easy storage. It includes a stability bar and ships fully assembled. The problem with the $50 range rebounders is that the springs start to break within a couple of months if used daily. The quality and build of the frame and the springs should be robust to withstand the forces of bouncing daily. Maximus Pro Gym Rebounder is a very sturdy indoor trampoline made from high grade steel that has an advance spring mechanism for frequent and heavy use. 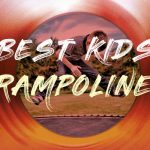 The Stamina 36 inch Folding Trampoline is one of the most popular and best selling low priced rebounders out in the market today. The tension is provided by the 30 bands, which have a width of 2 inches instead of metal springs. The elastic bands may start to wear off after six months, so as stated earlier, it is a good option for beginners who would want to explore rebounding in their workout routines. The frame is half-foldable and the legs can be removed for easy storage. 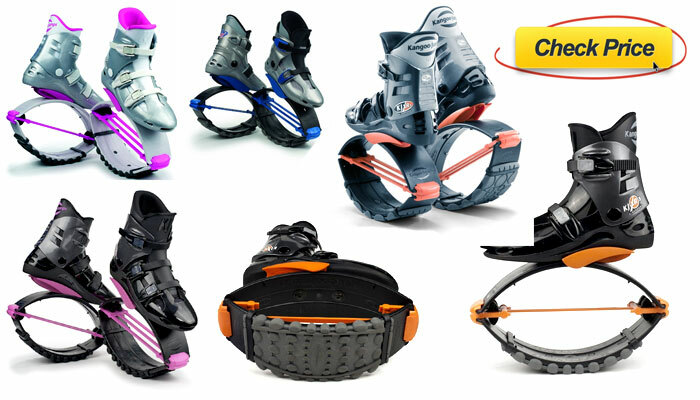 The Kangoo Jump boots can be described as a cross between a pair of inline roller blades and well a kangaroo! They are this hard shell polyurethane boots, buckles and a soft inner lining like roller blades. The spring arcs and tension bands provide a pretty decent bounce and propel you forwards. They are also equipped with a non-slip tread that helps you stay footed on a variety of terrain. The sensation of bouncing around is usually quite fun and a very good workout. They are an absolutely an instant attention getter because they are such unique and a conspicuous product. It is so much fun wearing these shoes and the rebound you get makes you feel like a kid again. The boots are much heavier than your typical running shoes but the rebound gives you a lot of forward motion. You should wear good quality athletic socks. This will avoid bruising and will give you the most comfortable fit. It is claimed that these boots can burn 25 percent more calories and have 85 percent impact reduction versus running. 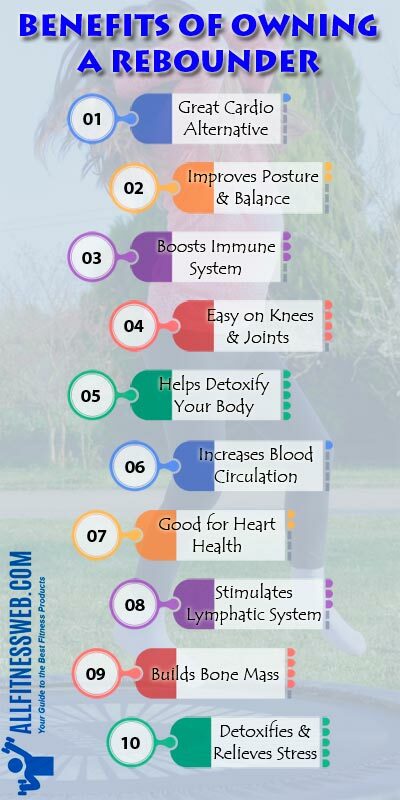 For those who cannot run because of bad knees or other condition that limit high impact activities, they provide a good low impact alternative to stay active. The general impression is all trampolines are the same. However, they differ with regards to their jumping surface, size, shape and amount of bounce. The difference in type depends on specific purposes, such as recreation, fitness, sports and even stress relief! This compact trampoline, also known as rebounder, is basically meant for indoor use by a single person. It is generally used for exercise purposes. Since rebounders are small in size, they are easy to store even in small homes. This is the most common type of trampoline and is available in various sizes. Since the expanse of the fabric is vast, it can be safely used by people of all ages without fear of falling out of it. In addition, the circular shape tends to push the user towards the center, if straying too close to the edge while bouncing. This makes it safe for use. A rectangular trampoline, though similar to a round trampoline, has some major differences. For one, it can be fitted in a corner or a narrow space, thereby saving space. However, the main difference between a round and a rectangular trampoline is in the quality of the bounce. A rectangular trampoline has a different bounce and the user is not automatically pushed towards the center. Moreover, its rebound is stronger due to uneven distribution of force and allows the jumper to spring higher in the air. This is the reason why a rectangular trampoline is preferred by gymnasts. An octogon, as compared to a roundal, has more surface area, providing more room for jumping and even for performing double flips! 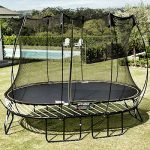 Although this trampoline is far superior, as far as the jumping goes, the quality of the bounce and rebound varies according to its size. Not only this, an octagonal trampoline is sturdier and lasts much longer than other variants. Rebounder or trampoline – what’s the difference? As already mentioned, a rebounder is smaller in size than a trampoline. It is also referred to as mini trampoline. Whereas, the size of a standard trampoline ranges between 7.5 feet and 16 feet in diameter, a rebounder is typically only 3.5 feet in diameter. 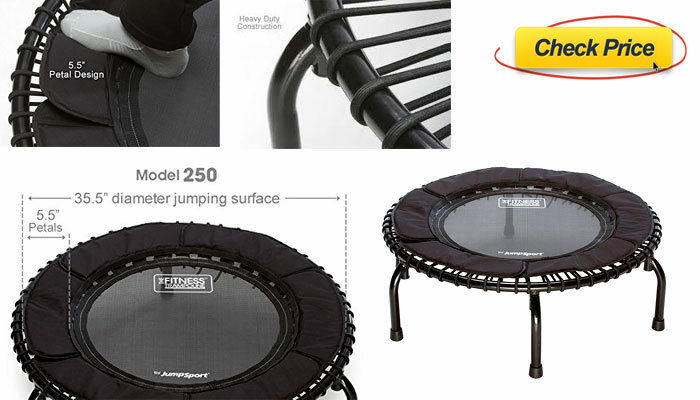 The size makes a trampoline ideal for outdoor use and a rebounder for indoor use. However, the main difference between the two lies in its use. A trampoline is primarily used for recreation, whereas a rebounder is typically meant for fitness and weight loss. The small diameter of a rebounder provides a smaller bounce than a trampoline, making it safe for users. Ideal for fitness, since it can be carried almost anywhere. Alleviates stress on legs and feet incurred because of high-impact activities, like running, since it imparts a low-impact bounce. It improves blood circulation, balance and coordination in people afflicted with joint pains, poor muscle tone and poor blood circulation. Compared to other fitness equipments, a rebounder is relatively cheaper. There is hardly anyone who is not impressed by a trampoline. The mere thought of getting catapulted to dizzying heights is enough to get an adrenalin rush. However, what most don’t know is this contraption is not only meant for recreation, but is recommended by experts as extremely beneficial for health and fitness, as well. Rebounding exercises or trampoline workouts can improve your health by boosting the critically important body system that most people never ever thought about. It’s your body’s built in disease fighting internal cleansing system called the lymphatic system. 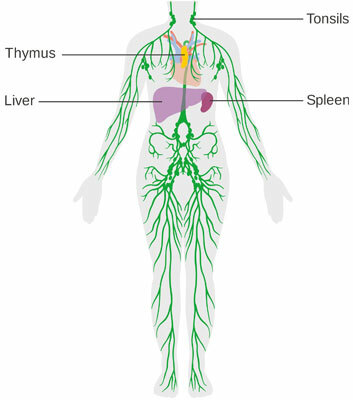 The lymphatic vessels carry lymph fluid and lymph fluid transports substances throughout your body and removes it from the tissues. A peak functioning lymphatic system helps to keep you healthy. Poorly moving lymph fluid is much like stagnant water. If you just sit still it becomes polluted and germs get locked into your lymphatic system if the fluids are not pumping throughout the vessels freely and efficiently. Now this can be a factor in degenerative disease. It’s a factor of rapid aging and early death. It’s one of the reasons lymphatic drainage is studied in diagnosis and treatment of cancer. A poorly functioning or diseased lymphatic system can result in swelling of many areas of the body. It will drastically reduce the body’s ability to fight infection. The lymph system does not have a pump to circulate the lymph fluid. The lymphatic fluid moves with the help of gravity and movement. When you work up and down in a rebounder, you increase gravity for a split second and for another split second you are without gravity. These gravitational forces along with sudden acceleration and deceleration massage the lymph system. This helps move the lymphatic fluid, which then nurtures the cells better and pulls toxins away from the cells. By rebounding, you stimulate the lymphatic system and this creates a cleansing and nourishing effect for your whole body. Jumping on a rebounder strengthens your glandular system. It actually improves the functioning of your thyroid, pituitary and your adrenal glands, which are the base of your body functioning properly. Rebounding also reduces pain and inflammation by increasing your circulation and the oxygen flow around the body. It serves as a natural analgesic. Another benefit of jumping on a trampoline is that it strengthens the arterial muscles, which in turn helps to reduce blood pressure. Rebounding is a low impact exercise and it is ideal for people who are recovering, rehabilitating or have mobility problems. Bouncing up and down on a trampoline also helps reduce cholesterol, helps improve digestion, aids relaxation and helps sleep better. If this form of exercise is of interest to you or any other exercise for that matter, do your homework – Google it, definitely talk to health professionals or others you know who are doing it, so that you can learn about it and how you might best incorporate it into your life. There’s no one size fits all for anything since we are all unique. So, learn as much as you can about something before incorporating it into your life and then based on that learning, create a routine that works for you. Is jumping on a mini trampoline a good exercise? An exclusive American Council on Exercise (ACE) sponsored research has found that bouncing on a mini trampoline, even for as less as 20 minutes, is equivalent to running. What’s more, it exercises the whole body and proves more fun than running. Can you lose weight jumping on a trampoline? The aspect of burning calories using a trampoline has been extensively researched by NASA. The study found that a 30-minute trampolining burns 42 calories in an adult weighing 150 pounds and 167 calories in a 200-pound individual. So, you are certain to lose weight jumping on a trampoline provided you adhere to your workout schedule for a longer period. Is rebounding better than running? According to various studies undertaken, the low-impact cardio workout is much better than straining your joints on solid ground, such as roads and pavements. Rebounding is much better than running for 33 minutes, since not only does it improve balance, it also increases the heart rate, thereby boosting the cardio. 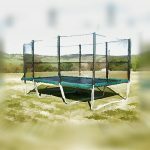 What to look for when shopping for a mini trampoline? Safety and Durability: For selecting any type of trampoline, be it regular or mini, safety is always of paramount consideration. So, take a look at its construction. It must have a metal framing, durable fabric and good quality springs and elastics. It should be stable when fully assembled. If buying a second hand one, ensure that all parts are in good condition. Size: Even for a mini trampoline, size matters. The size of the rebounder indicates its weight capacity and conveys whether it is fit for your weight category and those of other family members who will be using it. Buying the right size will prevent injuries. 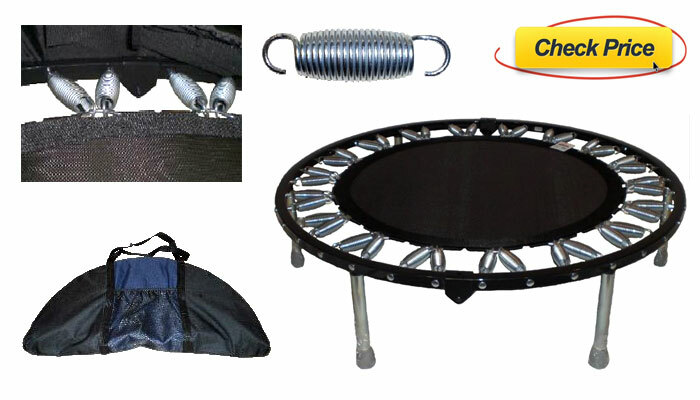 Accessories: Accessories and additional tools bestow better efficiency to the mini trampoline. For example, stability bars to hold on to while stopping the bounce, ladder to climb up and down the trampoline and a net enclosure for safety will go a long way in making trampolining a fun activity. Convenience: Even mini trampolines cannot be kept in ready state all the time, since it occupies space. So, buy one that can be easily dismantled for safe storage and assembled, as and when required. 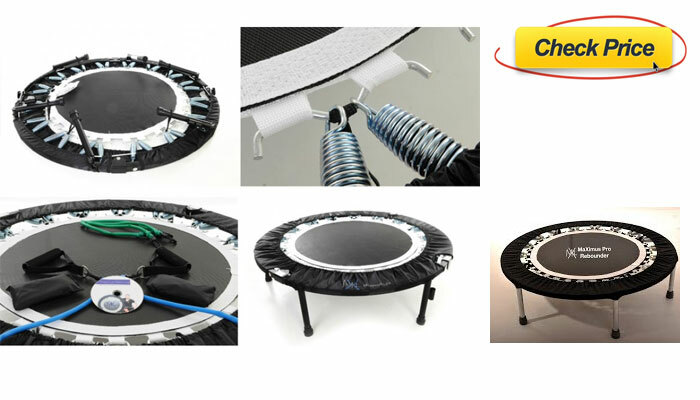 Price: Depending upon its features and quality of material, the price of a mini trampoline ranges from $20 to $400. Of course, more the features, the higher the price. 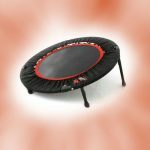 Selecting a rebounder or mini trampoline should satisfy the purpose for which it is being purchased. Whatever be the purpose, this contraption is great for recreation. So, why not buy one now and experience a different kind of high!